In landscape photography, panoramas are always hugely popular with both audiences and photographers alike. Let's take a look at how to get panoramic shots that really wow people. Orientation & Focal Length – Portrait or Landscape? Hands down no questions asked; if you intend to take headache free, good quality panoramas, shoot in portrait orientation. There are a number of reasons why but the most noteworthy is because it will be easier to stitch. It will also aid a good composition but I’ll touch on that later. “Do you need an expensive wide angle lens for panoramas?” No. In fact they’ll give you issues. Wide angles are great but they’re notorious for distortion, there’s no way around it. They like to streeeetch the edges. They’re also prone to heavier than usual vignetting (that darkness that comes in from the corners). “So what do you recommend?” Well I'm glad you asked. Anything in the mid zoom range. For those full frame shooters out there something between 35 & 80mm. APC cameras (Nikon D5000 3000 7000 series, Canon Kiss, Rebel, 500, 600, 60, 7D series, Sony Alpha, Nex etc) I’d recommend something in the 28-50mm range. Prime lenses are great for sharpness but not essential. Overlap, How Much is Too Much? In order for the software to do all that clever merging, blending and stitching it needs a reference point to work out what goes where. Or more importantly, a big enough reference point. In my experience 30% overlap is perfect. With 30% overlap you should be able to capture a scene in 5-6 successive shots. If you start shooting too many frames, things start to get a little tricky. Aperture, Shutter Speed, ISO White Balance, Focus – manually control them all. Make sure you have the camera in Manual. Set your aperture, I won’t go too much into which aperture, I'm going to assume you have a vague grasp on that already. (Check out our guide to depth of field for more about aperture – Ed.) Do the same with Shutter Speed and ISO. Now here’s the one I see miss all the time – set your White Balance. You don’t need a grey card or anything fancy, just set it to ‘Daylight’ or 5200k. This will ensure your blues are blue and your yellows are yellow. Most importantly though, it will make sure each of your frames are the same colour temperature. Focus; set this to manual too. If you have a camera with ‘Live View’ (most of them do), turn it on. Canons, Nikons and most others will have a 10x magnification button. Zoom in (not with your lens but with this button) and adjust your focus. Don’t focus on the closest object though, pick something that is roughly one third of the frame in, and focus on that. Using Live View will also help to reduce shake and movement when you hit the shutter. Turn off Stabilisation or Vibration Reduction and I also expect to see you using a cable release! Nodal Point, What is it and Why Should I Care? It goes without question that you should be using a good quality tripod for stitching images, but are you using the right head? Probably not. Panning or pivoting your camera on standard tripod head will cause big issues. The closer you are to your subject the bigger the issue. The easiest way to explain this is with a small experiment. While looking through your camera viewfinder hold up something in front on the lens, your fingers work best. Hold them so you can still see glimpses of the background between your fingers. Now, pivot the camera left and right as if it was on your tripod… watch what happens to the background. Your fingers begin to hide different parts of your background. As luck would have it, manufactures out there have developed tripod heads to factor this out. They’re called Nodal Point Tripod Heads. One of the more common ones is the ‘Nodal Ninja’. Each camera and lens combination has a different nodal point, a point that virtually eliminates this effect. 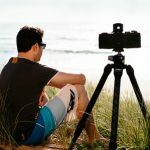 “Do I really need one?” If you’re serious about panoramic photography then yes! In the meantime you can practice without one and see if this style of photography is for you. Choose distant subjects to minimize the effect. The biggest mistake I see with panoramic photography is people get too caught up in the moment they forget the composition guidelines; rule of thirds, leading lines, framing, focal point and foreground interest. It’s an easy thing to do. I did it initially too but just trust me on this. It will make the difference between having something that looks okay as multiple screen wallpaper and something that looks amazing as a framed print on the wall. If you have trouble visualising a panorama you can cut a piece of card and look through it. 3:1 is the most common ratio but there are no right or wrong ratios. High Dynamic Range images are everywhere. I'm sure you know all about them. Personally I'm not a fan. In my opinion nothing beats the natural look of a good quality GND (Graduated Neutral Density) filter. By ‘good quality’ I'm referring to brands like Lee. They’re not cheap but they won’t give you a horrible magenta colour cast like their less expensive competitors. You can use GND filters when stitching but it’s critical that your tripod (and pan movement) is level. A level tripod is essential for a good panoramic shot regardless. Granted there a few limited times you can use them and get away with it, like in the jungle but as general rule, don’t use them and a avoid the disappointment. You've got the shots now what? Let the software do the rest. There many dedicated software packages for stitching, some paid and some free. I’ve tried most of them. PTGUI, AutoPano but I found recent versions of Photoshop gave the most consistent accurate results. Do your own experiments though, if one application doesn't work try another. I don’t stitch photographs anymore, nor use Photoshop for that matter but if you would like to check out some panoramic photography examples, please feel free to visit the website.